Image Digicolor is a range of smooth uncoated papers and card specially developed to achieve professional results with colour laser printers, copiers and digital colour presses. 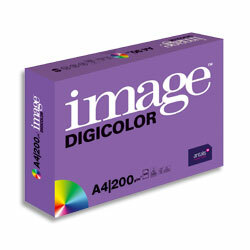 Image Digicolor is ideal for digital and variable data printing, custom print jobs, promotional materials, reports and business communications. It is particularly suitable for producing promotional documents, brochures, newsletters, invitations, menus, direct marketing material, personalised photobooks and calendars. The heavier card weights are perfect for producing business cards, postcards, tags and greeting cards. Image Digicolor combines an excellent level of whiteness with high opacity to deliver sharper contrast printing, vivid colours and excellent printability. Ideal sheet formation and smoothness deliver consistent print quality, denser pictures and perfect toner transfer. The high level of stiffness and excellent dimensional stability ensures jam free printing, consistent results and problem-free two sided printing. Image Digicolor is suitable for all mono and colour laser printing and is fully guaranteed for use on full colour laser machines. Tested and approved by leading equipment manufacturers. Suitable for all finishing processes from stapling, perforating, folding and binding to laminating, varnishing, sealing and embossing. FSC and EU Eco Label for environmental peace of mind. ISO 9001. ECF.